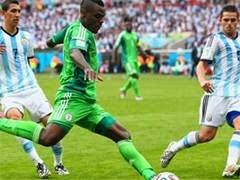 In today's first match of the World Cup football tournament and with Argentina and Nigeria. Capelta Paul made ​​the first minute of the match Argentina fined. In the next minute shuttle to be swollen or fined for the same reason. Argentina star player of the team in the 3rd minute of the game, Massie scored a wonderful goal. For its part, the next minute the Nigerian team kolatittu acattinar Musa. After that, both teams scoring pose is often blocked. After a free kick in the 45th minute of the match by scoring a goal acattinar Massie. The first half of the game ended, the referee announced. Since the start of the second half of the match, in the 47th minute with a goal scored Nigeria's Musa again. The two teams with the goal of the account balance. Argentina scored a goal in the 50th minute, rojo, raising their team's goal tally. When Argentina Nigeria 2-3 in the final match was declared winner in terms of the goal. Massie was elected Man of Argentina.